Bushy shrub with green leaves, and light pink bell shaped flowers in summer. Evergreen. Hardy. Sun. Green leaves with white margin, new growth is pinkish-brown. White flowers. Evergreen. Hardy. Sun. Bushy shrub with yellow and green leaves. Pink-white flowers all year. Evergreen. Hardy. Sun. 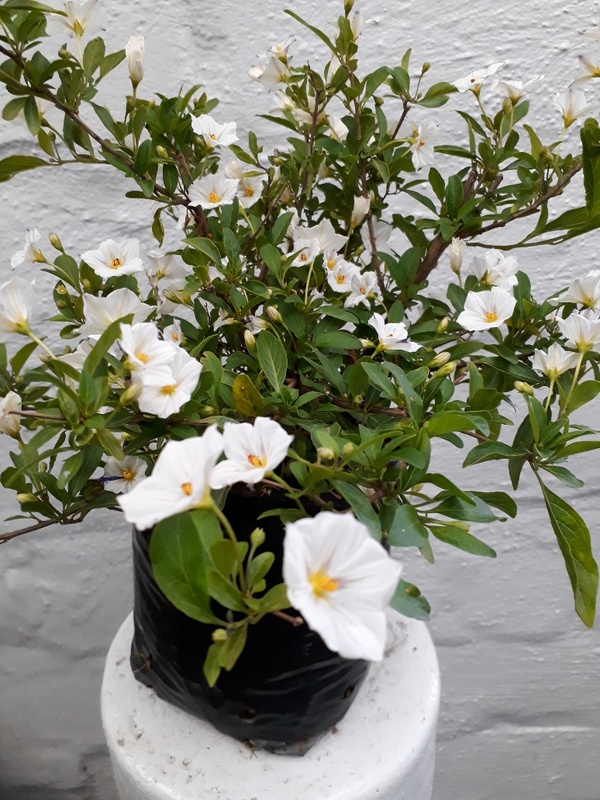 Dark, shiny leaved plant with lightly scented, white, bell shaped flowers in summer. Evergreen. Hardy. Sun. 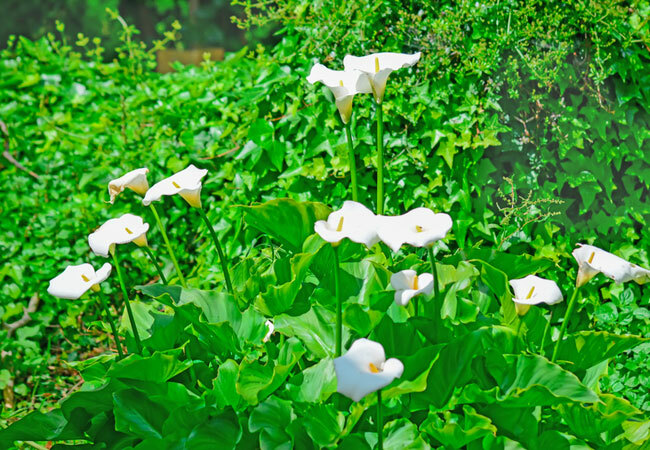 Perennial with long white and lilac flower stalks during spring. Semi-deciduous. Hardy. Semi-shade to shade. Indigenous. 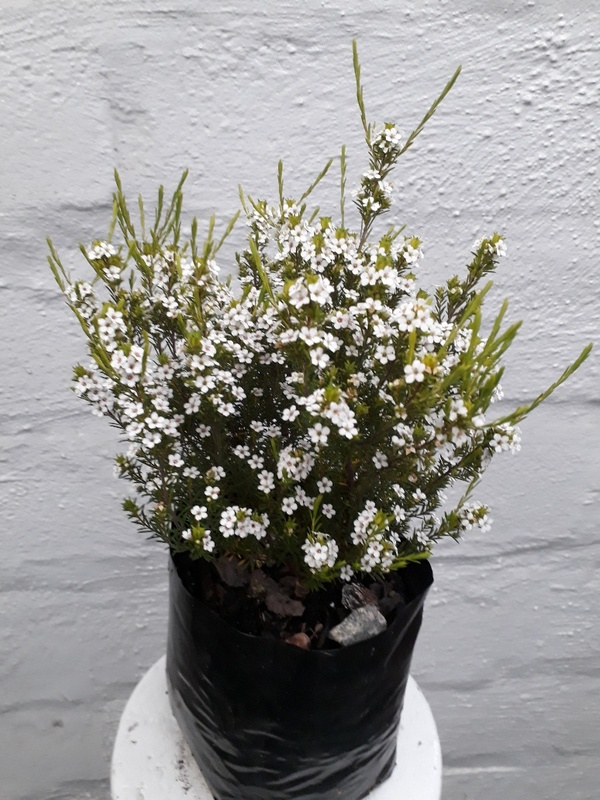 Small, compact, dark green tuft-forming plant with white, umbrella shaped flowers on short stems. Summer flowering. Hardy. Sun to shade. Indigenous. Small, compact, dark green tuft-forming plant with light blue flowers on short stems. Summer flowering. Evergreen. Hardy. Sun to shade. Cream and green variegated clump-forming groundcover with umbels of light blue tubular flowers on stalks in summer. Evergreen. Sun to Shade. Hardy. Indigenous. Compact, dark green tuft-forming plant, with white flowers on long stems. Summer flowering. Evergreen. Hardy. Sun to shade. Indigenous. 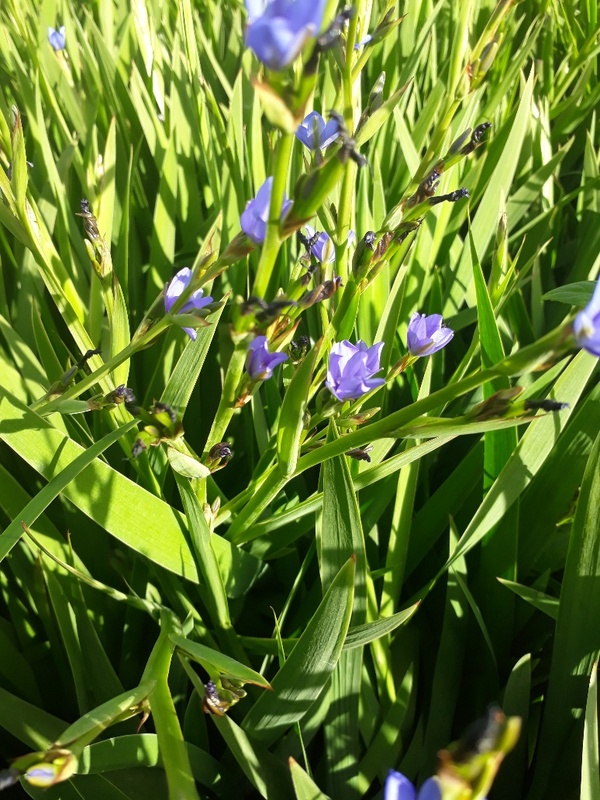 Compact, dark green tuft-forming plant, with dark blue flowers on long stems. Summer flowering. Evergreen. Hardy. Sun to shade. Agathosma glabrata is indigenous and threatened in it's natural habitat. This buchu grows to between 500mm and 1m high and is covered in masses of purple, white or pink flowers that attract bees and butterflies. It is a good garden specimen that also works well in pots and is grown for its flowers and aromatic leaves. Form plant with large, green leaves. Deciduous. Shade. Tender. Herbaceous shrub with lemon scented leaves and small white flowers in summer. Cut back in autumn. Deciduous. Sun. Indigenous. 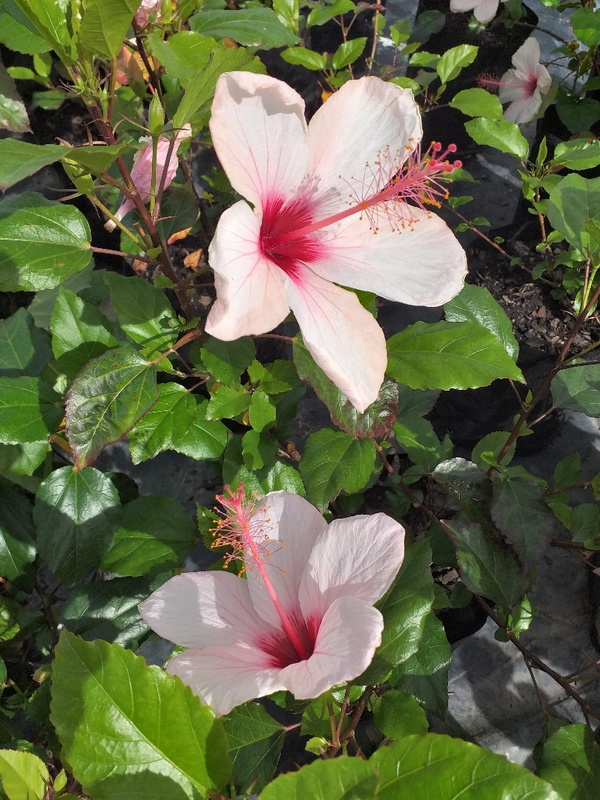 Upright growing shrub, with pink miniature hibiscus-like flowers having a deep red mark in the center. Flowers during spring and summer. Evergreen. Uniform compact plants. Ideal for pots or bedding. Full sun. Ht 20-30 cm. Indigenous. Sky-blue flowers on long stalks in summer. Strap-like, ribbed leaves. Ideal near a stream. Evergreen. Hardy. Sun to Shade. Indigenous. Structural plant with striking, star shaped flowers and leathery strap-like leaves. Sun. Indigenous. Dark green plant with arching, foxtail-like branches, very compact and fine leaved. Evergreen. Sun to shade. Indigenous. 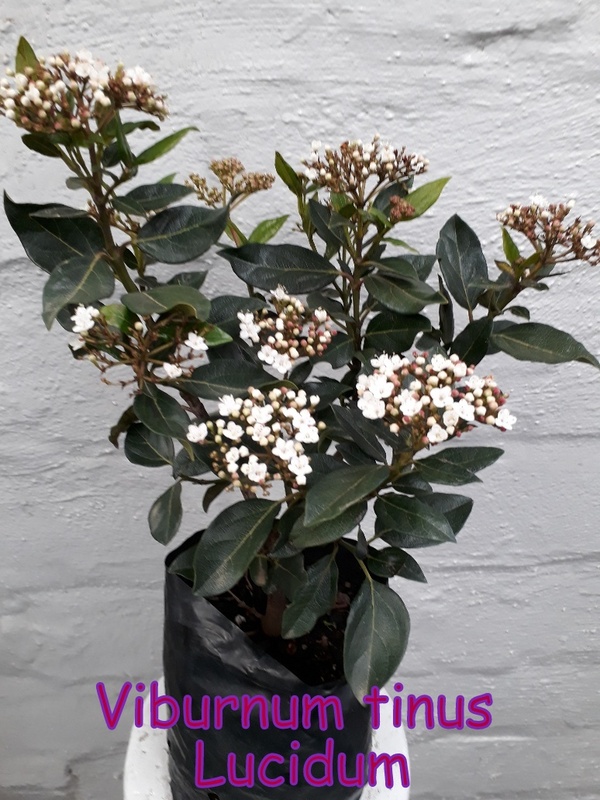 Compact, upright, dark green plant, with white flowers succeeded by red berries. Evergreen. Semi hardy. Sun to shade. Indigenous. Fine leaved shrub with hanging branches and white flowers succeeded by red berries. Ideal groundcover or container plant. Evergreen. Semi Hardy. A tough plant for indoors or outdoors, with leathery leaves straight out of the soil. Evergreen. Hardy. Semi-shade to full shade. Indigenous. Fast growing, upright, densely leafy shrublet. Bright golden yellow, showy honey scented flower heads at the ends of branches. Slow growing shrub with yellow spotted foliage. Evergreen. Hardy. Shade. Single white flowers in late winter. Acid soil. Evergreen. Hardy. Shade. Single mauve flowers in late winter. Acid soil. Evergreen. Hardy. Shade. Single, dark pink flowers in late winter. Acid soil. Evergreen. Hardy. Semi-shade to shade. Single, reddish-pink flowers in late winter. Acid soil. Evergreen. Hardy. Semi-shade to shade. Double white flowers in late winter. Acid soil. Evergreen. Hardy. Semi-shade to shade. Smaller bamboo with green leaves and yellow stems. Evergreen. Sun to shade. Indigenous. Covered in magenta pink flowers in autumn. Shiny dark green foliage. Fast spreading grondcover. Sun. Indigenous. Small herbaceous shrub with pale, hairy green leaves. Covered in masses of violet-blue flowers in autumn. Evergreen. Semi-hardy. Sun to semi-shade . Indigenous. Compact, herbaceous shrub with dark green leaves. Bright purple flowers in autumn. Tender. Sun. Indigenous. Compact, herbaceous grondcover with masses of rose-pink flowers in autumn. Evergreen. Semi-hardy. Sun. Indigenous. Dense shrub covered in brick-red flowers in summer and autumn. Evergreen. Tender. Sun to shade. Bare-stemmed plant with bulbous base and long, narrow, weeping leaves. Evergreen. Semi-hardy. Sun to shade. 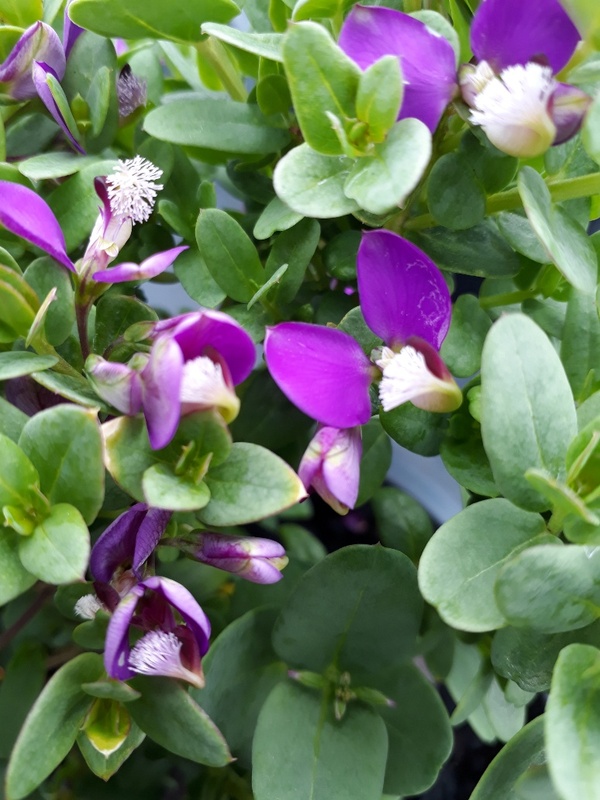 Slow growing shrub or grondcover, with small purple bracts all year. Tender. Sun. Small compact shrub with small single purple-pink bracts all year. Prune regularly. Tender. Sun. 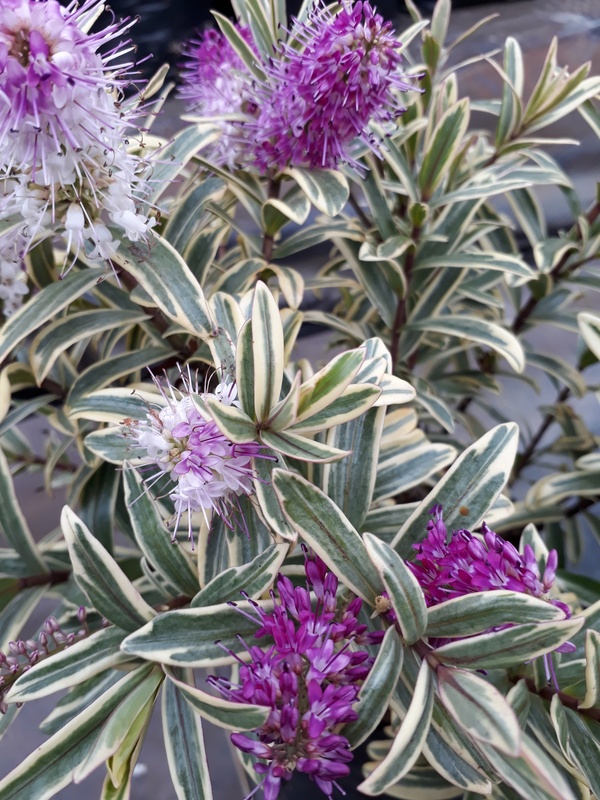 Rounded shrub with attractively coloured foliage in green, pink and white. Evergreen. Tender. Semi-shade. Shrub with leathery green leaves. Scented blue-purple flowers fade to pale purple and white. Evergreen. Tender. Sun. Indigenous. Shrub to small tree, leaves glossy on top and dull grey underneath. Branches weeping, sweetly scented creamy yellow flowers. Evergreen. Semi hardy. Semi shade to sun. Indigenous. 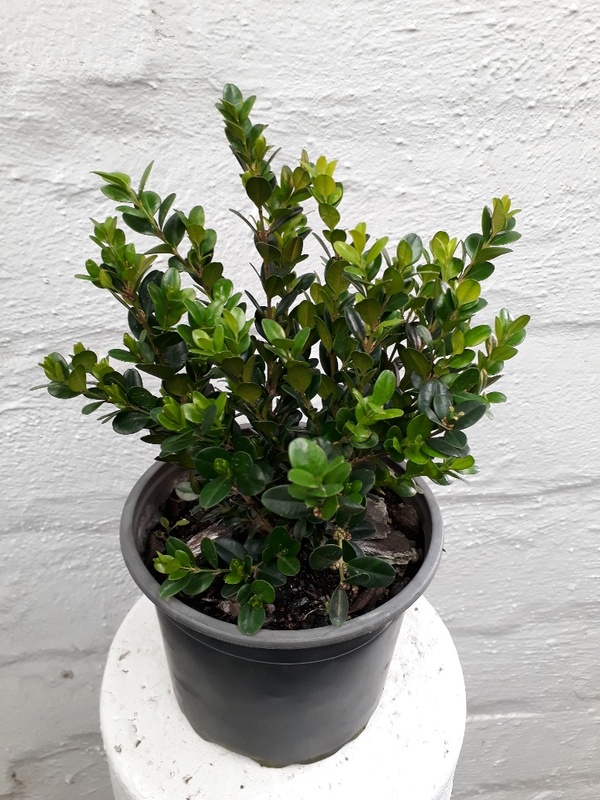 Small tree or shrub with medium to dark green leaves. White to creamy, honey-scented flowers in spring. Evergreen. Hardy. Sun. Indigenous. Shrub to small tree with grey-green leaves. White to lilac or purple flowers with dark orange throat in spring. Sweetly scented. Evergreen. Semi hardy. Sun to semi-shade. Indigenous. Shrub to small tree, with glossy dark green leaves and dense clusters of orange tubular flowers, followed by interesting urn-shaped fruit. Sun to semi-shade. Compact upright shrub with small oval bright green leaves. Ideal for hedges and topiaries. Evergreen. Hardy. Sun. Shrub with glossy green leaves producing masses of flowers in a range of colours from late autumn to early spring. Prefers acid soil. Evergreen. Hardy. Semi-shade. Indigenous. Fast growing shrub with glossy small green leaves and lots of thorns. Small scented white flowers, followed by red berries. Evergreen. Hardy. Sun. Indigenous. Thorny, dark green grondcover with fragrant white flowers followed by red berries in autumn. Good coastal plant. Evergreen. Semi hardy. Sun. Indigenous. Bright green thorny shrub with fragrant white flowers, followed by edible red berries in autumn. Evergreen. Hardy. Sun to shade. Indigenous. Shrub to small tree with greyish-green leaves and masses of yellow flowers in autumn to spring. Excellent plant for consolidating sand. Semi hardy. Sun. Bushy shrub with round, furry grey-green leaves. Purplish-pink flowers with a yellow central blotch from early summer. Evergreen. Hardy. Sun. Bushy shrub with large rosy-crimson flowers with maroon blotches. Flowers in early summer. Evergreen. Hardy. Indigenous. Fast growing shrub, with two-tone blue flowers in summer. Evergreen. Tender. Sun. Indigenous. Small, compact dark green plant with fleshy leaves. Dark orange flowers on short stems in spring. Evergreen. Semi hardy. Shade. Shrub with fine aromatic needle-like golden-yellow foliage and masses of pale pink flowers in spring and summer. Needs well-drained soil. Evergreen. Hardy. Sun. Indigenous. Shrub with fine aromatic foliage and masses of white flowers in spring and summer. Needs well-drained soil. Evergreen. Hardy. Sun. Indigenous. Shrub with fine aromatic needle-like foliage and masses of pale pink flowers in spring and summer. Needs well drained soil. Evergreen. Hardy. Sun. Shrub with tropical appearance. Glossy, dark green leaves with yellow coloured edges. Evergreen. Semi hardy. Sun. Shrub with glossy, green centered leaves that have a white margin and green spots. Evergreen. Semi-hardy. Sun to semi-shade. Glossy, dark green leaves with yellow edges. Tropical appearance. Evergreen. Semi hardy. Sun. Shrub with tropical appearance. Glossy dark green leaves. Evergreen. Semi hardy. Sun. 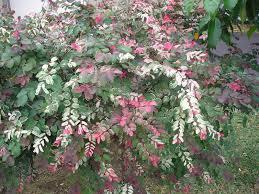 Compact round shrub with dark green, cream and pink leaves. Tropical appearance. Evergreen. Semi hardy. Sun. Shrub with glossy white leaves and green spots. Evergreen. Semi-hardy. Sun. Brown-green leaves which turn to chocolate-brown in winter. Evergeen. Hardy. Sun. Glossy, dark green foliage. Fast growing and drought resistant. Evergreen. Semi-hardy. Sun to shade. Narrow, upright, fast growing plant. Long, arching reddish bronze leaves. Evergreen. Hardy. Sun to shade. Fast growing, upright plant with arching dark red leaves. Focus plant. Evergreen. Hardy. Sun. Focus plant. Upright with darker red leaves than Red Sensation. Evergreen. Hardy. Sun. 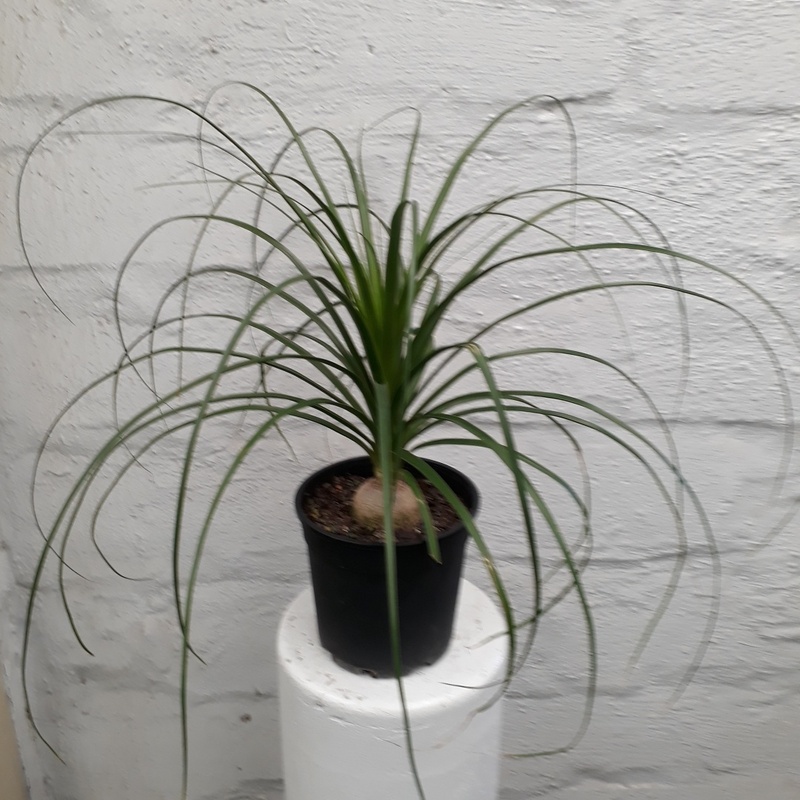 Fast, upright growing plant with long arching green leaves. Evergreen. Hardy. Sun to shade. Indigenous. Bulbous with stiff, linear leaves. Dark golden-yellow flowers in summer. Deciduous. Hardy. Sun. Indigenous. Bulbous plant with stiff, linear leaves. Showy red flowers are borne in summer. Lift and divide in winter. Deciduous. Hardy. Sun. Indigenous. Beautiful orange star-shaped flowers in late summer and autumn. Prefers a cool spot. Deciduous. Hardy. Sun to semi-shade. Useful shrub with long, bright red tubular flowers tippped in white. Evergreen. Hardy. Sun. Fast growing, dense shrub with larger leaves and flowers than C. hyssopifolia. Lilac flowers all year. Tender. Sun to semi-shade. 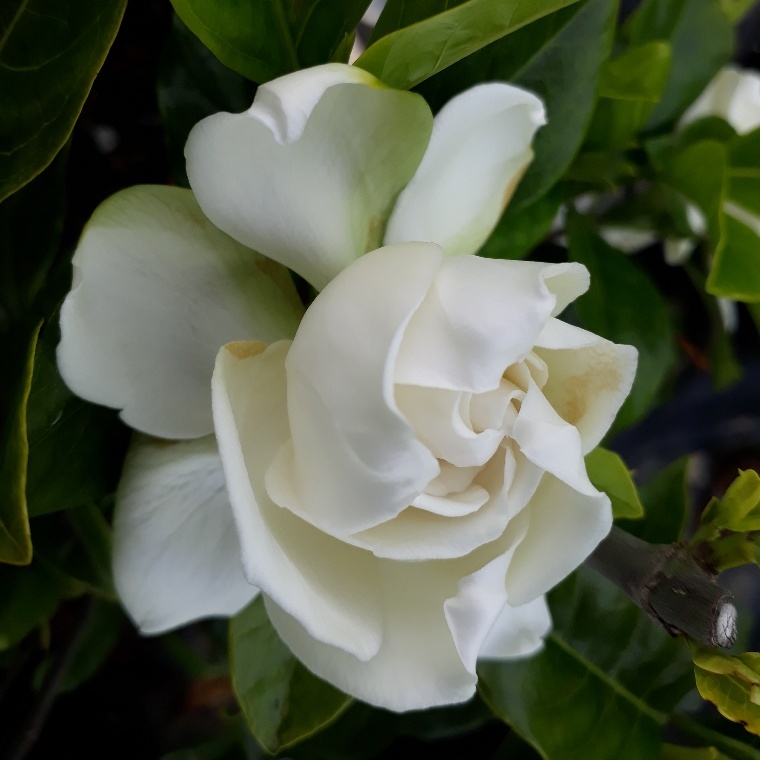 Fast growing, dense shrub with white flowers and glossy dark green leaves. Flowers all year. Evergreen. Tender. Sun. Hairy, rough stemmed tree fern with plume-like leaves on top of crown. Evergreen. Semi hardy. Shade to sun. Hairy, rough stemmed tree fern. Plume-like leaves on top of crown. Evergreen. Semi-hardy. Full sun if kept moist, otherwise shade.. 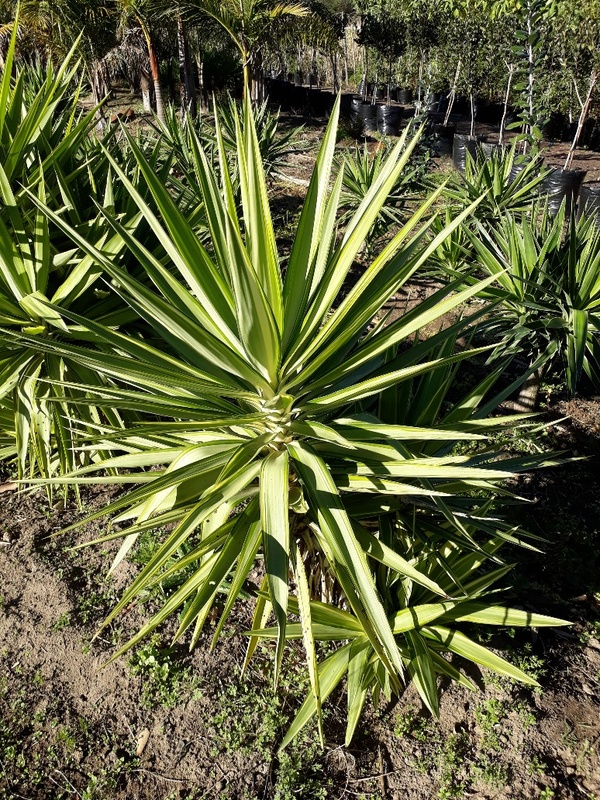 Slow growing palm-like plant, may be single or multi-stemmed. Evergreen. Semi-hardy. Sun to shade. Grass-like perennial with sword shaped green and white striped leaves. Blue to purple flowers in summer. Evergreen. Semi hardy. Sun to shade. Tree fern with a solid stem and a spreading crown. Palm-like leaves. Long lifespan, frost and heat tolerant. Hardy. Semi-shade to Shade. Indigenous. Grass-like plant, upright growing with ribbon-like leaves. Pink-purple bell shaped flowers in spring. Evergreen. Hardy. Sun to shade. Indigenous. Perennial with sword shaped leaves. 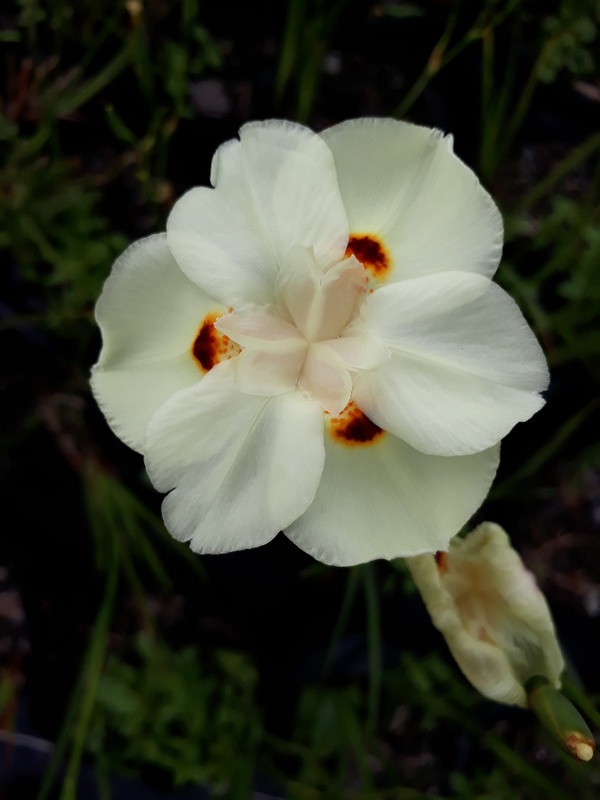 Pale yellow, iris-like flowers with brown spots in late spring to summer. Evergreen. Hardy. Sun to shade. Indigenous. Clump forming perennial with narrow, dark green foliage. White flowers with blue markings on in late spring to summer. Drought resistant. Evergreen. Semi-hardy. Sun to Shade. Indigenous. Small tree or shrub with shiny, light green leaves. Greenish-yellow flowers followed by a capsule of papery wings, greenish red in colour. Evergreen. Hardy. Sun. Bushy shrub with dark purple to light green foliage. Fast growing, good hedging plant. Good at coast. Evergreen. Hardy. Sun. Shrub with light green foliage and purple flowers with white edges. Evergreen. Sun. Hardy. Beautiful golden foliage. Loves sun to attain its golden yellow leaves. Ideal feature plant. Semi-hardy. Sun to shade. Indigenous. 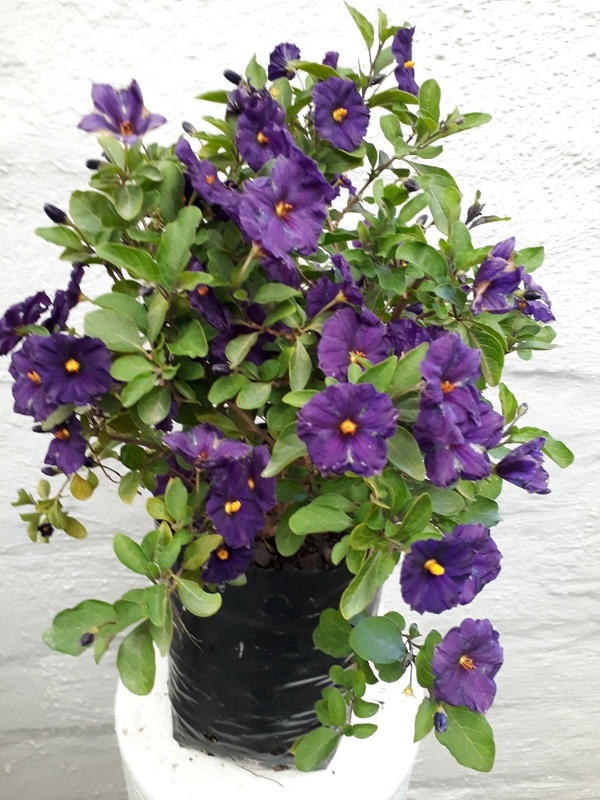 Fast growing shrub with lush green foliage and large blue-purple tubular flowers in summer. Thrives in moist shady spots. Evergreen. Shade. 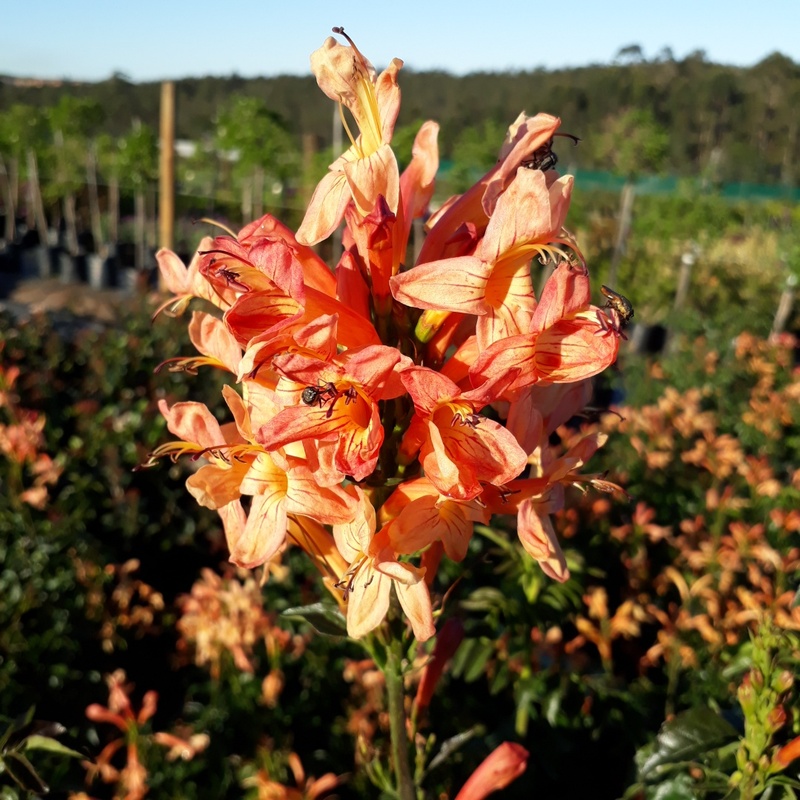 This fynbos shrub grows to a height of approximately 1m and is covered in small pink to white flowers for most of the year and is attractive to bees. This plant can be trimmed back whether in flower or not. Mulch with good compost in spring and autumn and feed with slow release fertilizer. It grows well in rockeries, on sandy slopes and coastal gardens. Indigenous. Excellent coastal shrub with fragrant soft grey-green leaves with small white flowers in autumn to early summer. Shrub with glossy foliage and pink and white apple blossom-like flowers in spring and summer. Evergreen. Hardy. Sun. Dense growing shrub, with glossy foliage and clusters of white flowers in summer. Hardy. Sun. 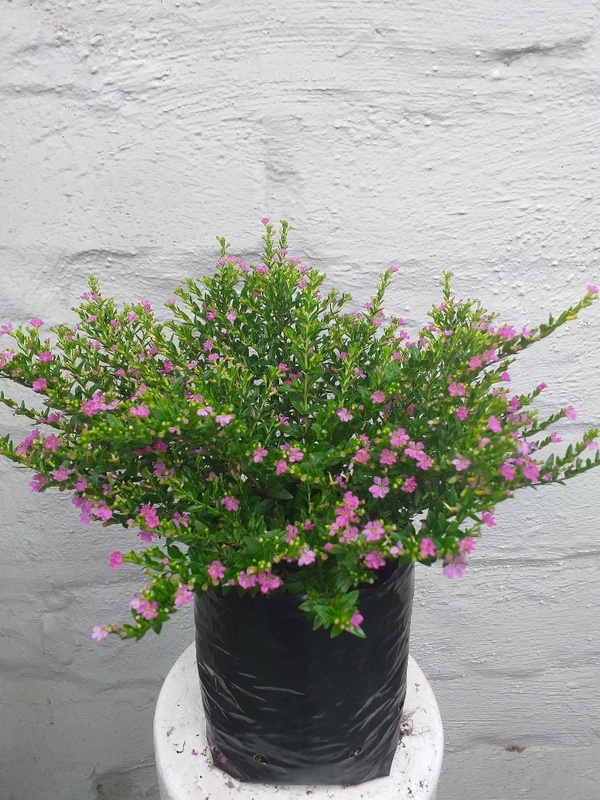 Compact, fast growing shrub, with clusters of pink flowers in summer and autumn. Hardy. Sun. Slow growing shrub with leathery, dark-green yellow-centered leaves. Evergreen. Hardy. Sun. Slow growing, compact shrub with small green and white foliage. Evergreen. Hardy. Sun. Slow growing, compact shrub with small, bright green foliage. Evergreen. Hardy. Sun. 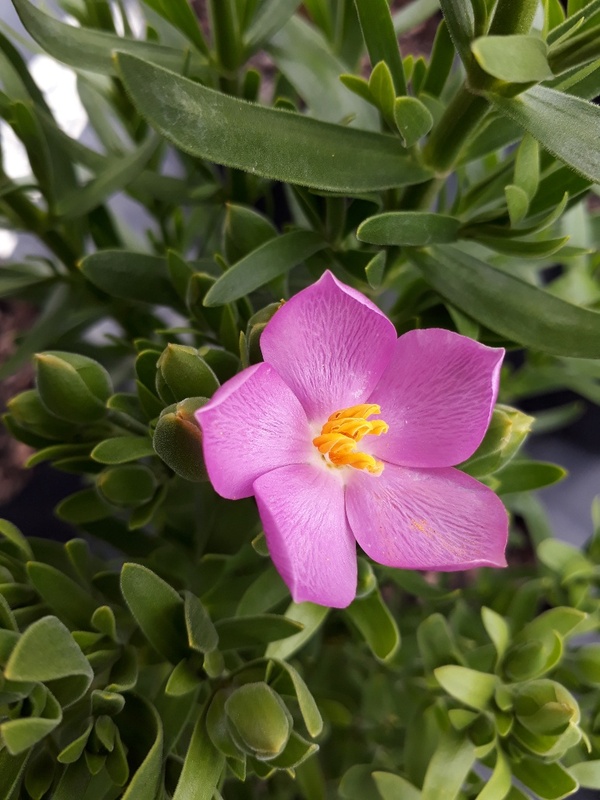 Bushy, low growing succulent with fleshy thorny stems and branches. Bright green leaves and salmon-pink flowers. Evergreen. Sun. Tender. Succulent shrub with spiny stems. Prominent red flower bracts through the year, but mostly in spring. Needs well drained soil. Tender. Sun. Succulent shrub with spiny stems. Prominent yellow flower bracts throughout the year, but mostly in spring. Needs well drained soil. Semi-deciduous. Tender. Sun. Indigenous. Small shrub with bright yellow daisy flowers in late summer, winter and spring. Variegated leaves. Evergreen. Hardy. Sun. Indigenous. Grey-green leaved shrub with yellow daisy-like flowers in late summer, winter and spring. Evergreen. Hardy. Sun. Indigenous. Fast growing herbaceous shrub with dark green foliage. Delicate yellow flowers in winter and spring. Evergreen. Hardy. Sun. Indigenous. Bushy growing small shrub with white, daisy-like flowers all year round. Evergreen. Semi hardy. Sun. Indigenous. Round, bushy, compact shrub with blue daisy-like flowers all year round. Evergreen. Semi-hardy. Sun. Indigenous. Bushy, compact shrub with blue daisy-like flowers all year round. Evergreen. Semi Hardy. Sun. Indigenous. Early, free flowering, drought-tolerant series. Full sun. Ht 45-60cm. Indigenous. Shrub or small tree with willow-like leaves and droopy heads of creamy golden flowers with honey fragrance in spring. Evergreen. Semi-hardy. Sun. Indigenous. Medium shrub to small tree from tropical Africa. Tiny purple flowers in summer. Evergreen. Semi hardy. Sun. Indigenous. Medium shrub to small tree from tropical Africa. Tiny white flowers in summer. Evergreen. Semi-hardy. Sun. Upright deciduous shrub with semi-double flowers with pink sepals and rosy violet petals. Grows up to 62 cm tall. Partial shade. Perennial upright shrub with distinctive long, salmon-orange flowers and matt, dark blue-green foliage. Height 0.5 - 1m. Partial Shade. Bushy shrub with single flowers with deep rose-pink sepals and deep cerise-pink corolla. Tender. Partial shade. Compact, upright, bushy shrub. Flowers have red sepals and semi-double pink splashed purple corollas. Semi-shade. Compact upright, bushy, deciduous shrub. Flowers with red sepals and semi-double pink splashed purple corollas. Semi-shade. Small upright deciduous shrub with single flowers with orange-rose sepals and orange-red corolla. Partial shade. Small bushy shrub with single flowers with bright red sepals and deep pink corolla. Tender. Partial shade. Bushy shrub with double flowers of purple splashed with pink sepals and pink corolla. Tender. Partial shade. Trailing shrub bearing double flowers with white sepals and red corolla. Ideal for hanging baskets and containers. Tender. Partial shade. 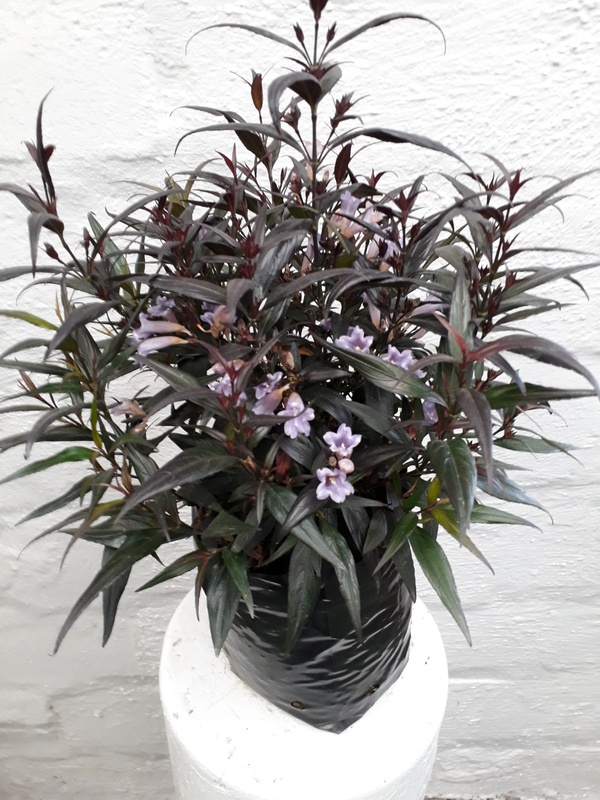 Compact, upright grower with light purple and red single flowers. Partial shade. Glossy leaved shrub with double white, scented flowers in summer. Evergreen. Semi hardy. Semi shade. Glossy leaved shrub with sweetly scented semi-double flowers in summer. Evergreen. Semi hardy. Semi shade. Glossy leaved shrub with fragrant white flowers that turn yellow. Flowers in summer. Evergreen. Semi-hardy. Sun. Bushy perennial with masses of white flowers with a pink flush in spring and summer. Evergreen. Tender. Sun. Bushy perennial, with masses of white flowers with a pink flush in spring and summer. Evergreen. Tender. Sun. Perennial. Leaves give off lemon scent when bruised. Sun. Indigenous. Perennial with narrow grey-green leaves and pretty, scented white flowers in summer. Grows well near water. Semi-hardy. Sun. Indigenous. Scrambling shrub or small tree with beautiful purple, pink or mauve flowers in spring to summer, followed by interesting four-lobed fruit. Evergreen. Hardy. Sun. Compact, herbaceous shrub with small clusters of blue flowers all year. Evergreen. Hardy. Sun. Small upright growing dark green shrub with clusters of lilac-purple flowers in summer. New growth is dark purple. Evergreen. Hardy. Compact shrub with narrow white, green and pink foliage. Clusters of pinkish flowers in spring and summer. Evergreen. Hardy. Sun. Round growing shrub with dense, dark green foliage and white flowers in summer. Evergreen. Hardy. Sun. Round growing, compact shrub with dull green foliage and smalll white flowers all year. Evergreen. Hardy. Sun. Indigenous. 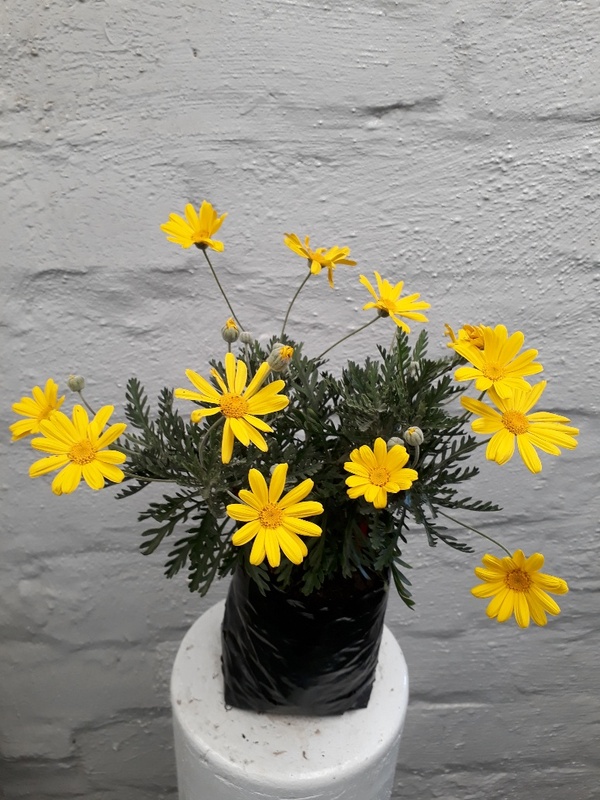 Shrublet up to 30cm tall with needle like leaves and yellowish flowers. Perennial. Hardy. Sun to semi-shade. Perennial plant with flowers from spring to autumn. Following colours available: light apricot, salmon pink, dwarf double yellow and crimson red. Hardy. Sun. Large flowered varieties. Evergreen. Tender. Sun. 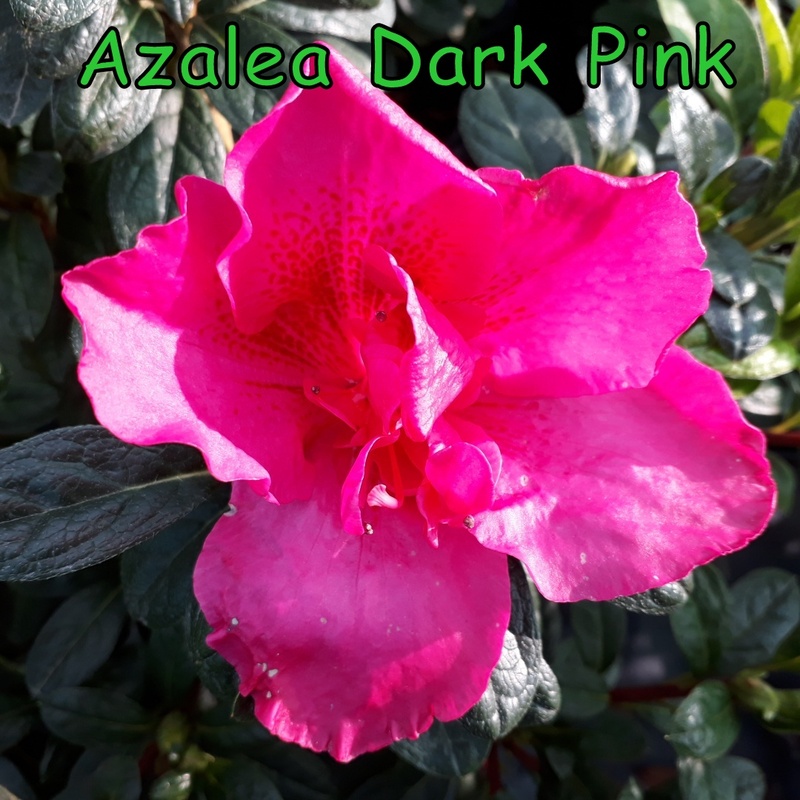 Shrub with dark green foliage, large single bright pink flowers from spring to summer. Evergreen. Tender. Sun. Large shrub, with leaves in shades of autumn colours. Small red flowers from spring to summer. Evergreen. Tender. Sun. Shrub with dark green foliage, medium sized single red flowers all year. Evergreen. Tender. Sun. 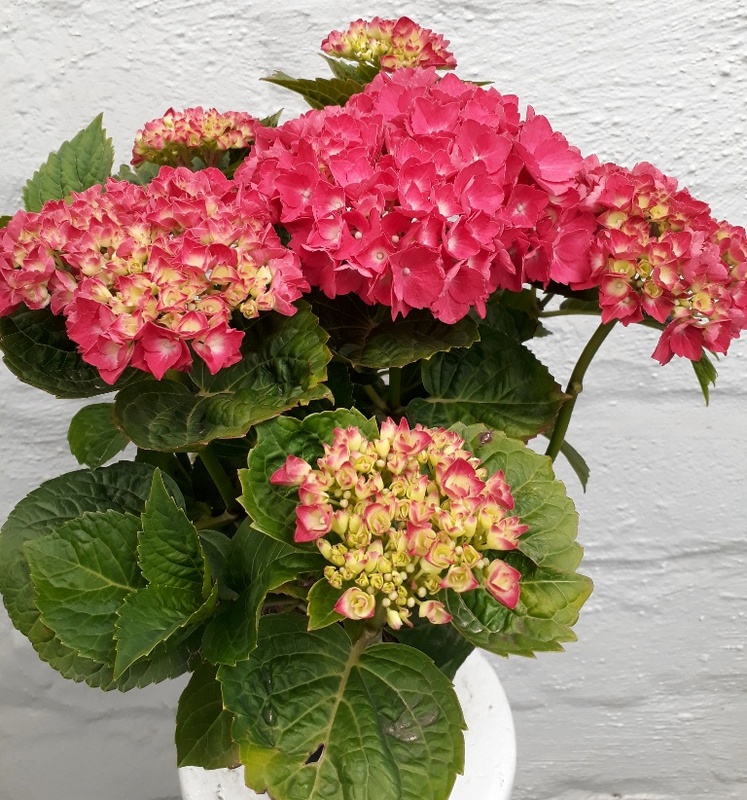 Large shrub with bright green foliage and light pink single flowers with a maroon eye, vitually all year round. Evergreen. Hardy. Sun. Double flowers, orange with maroon centre. Evergreen. Tender. Sun. Shrub with bright green foliage and large single to semi-double bright yellow flowers with white eye. Evergreen. Sun.Tender. Single yellow flowers with warm red throat. Dark green foliage. Evergreen. Tender. Sun. Shrub with bright green foliage and large single yellow flowers with a white eye and white radiating veins. Evergreen. Sun. Tender. 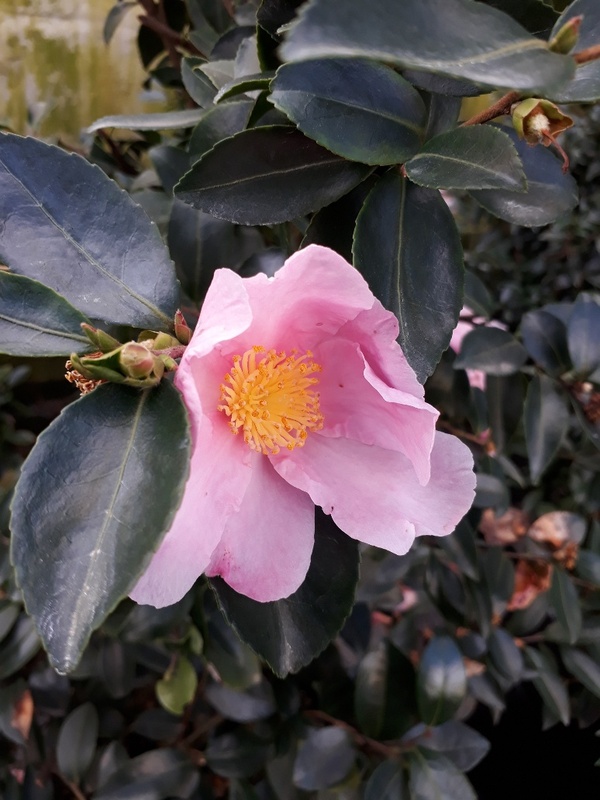 Large, glossy, dark green shrub with large, double pink flowers from spring to autumn. Evergreen. Tender. Sun. Single yellow flowers. Slow grower. Evergreen. Tender. Sun. 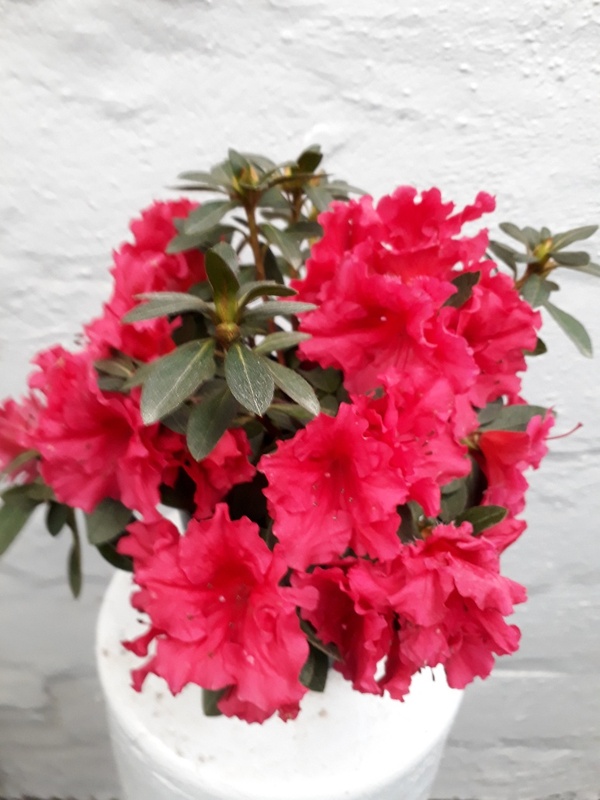 Medium sized single bright pink flowers with cream throat. Evergreen. Tender. Sun. Shrub with single pink flowers. Evergreen. Tender. Sun. Semi-double salmon-pink flowers with deep red centre. Medium growth. Evergreen. Tender. Sun. Double cerise pink flowers. Strong grower. Evergreen. Tender. Sun. Single apricot flowers. Vigorous grower. Evergreen. Tender. Sun. Shrub with small dark green foliage and single frilly white flowers. Evergreen. Tender. Sun. Shrub with large green leaves and large clusters of blue, white, red or pink flowers in summer. Prune in winter. Deciduous. Tender. Semi shade to shade. Indigenous. Small rounded shrub with soft pale green leaves and soft pink flowers in autumn. Evergreen. Tender. Sun to semi-shade. Indigenous. Small rounded shrub with soft pale green leaves. Pure white ribbon like flowers in autumn. Evergreen. Tender. Semi-shade to sun. Indigenous. Small rounded shrub with soft pale green leaves. Pale purple flowers with maroon markings borne in profusion in autumn. Tender. Semi-shade to sun. Slow growing shrub with oval, spiny dark green glossy toothed leaves with wide cream margins. White flowers are followed by red berries. Evergreen. Hardy. Sun. Indigenous. Large shrub, small round leaves and sprays of pink pea flowers in summer. Semi deciduous. Sun to semi shade. Indigenous. 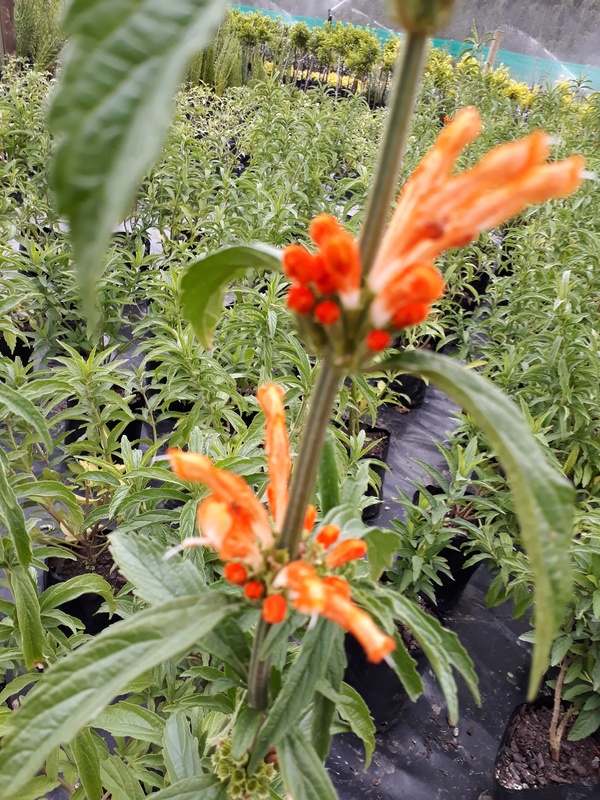 Large clumps of strap-like leaves, with bright orange poker shaped flower heads on tall, stout stalks. Winter flowering. Tolerates moist conditions. Semi-hardy. Sun. Indigenous. Fast growing, drought resistant shrub with hairy, tapering leaves. Velvet orange flowers in autumn are carried in whorls at top of each stem. White variety also available. Loved by sunbirds. Sun. Medium shrub with small needle like grey green leaves. Flowers double, light pink from winter to spring. Evergreen. Hardy. Sun. Medium shrub with needle like maroon green leaves. Flowers double, dark red from winter to spring. Evergreen. Hardy. Sun. Medium shrub with small needle-like green leaves. Flowers double, pink from winter to spring. Evergreen. Hardy. Sun. Medium shrub with small needle-like grey green leaves. Double flowers from winter to spring. Evergreen. Hardy. Sun. Perennial. Pure white flowers with yellow centres. Grow 25 - 30cm high. Full sun. Herbaceous, dark green perennial. Paper-like, long-lasting blue flowers on long stems in late summer to autumn. Ideal for rockeries. Evergreen. Semi hardy. Sun. Densely branched small yellow leafed shrub. Creamy white flowers in spring, followed by purple berries. Evergreen. Hardy. Sun. Fast growing shrub with scented pink and yellow flowers in summer. Semi deciduous. Hardy. Sun. Indigenous. Fast growing shrub with glossy, dark green foliage and trumpet shaped, pale mauve flowers in spring. Tender. Shade. Round, fine leaved shrub with green foliage . Hardy. Sun. Indigenous. Rounded, sturdy shrub with grey needle-like leaves. Honey scented white flowers in winter. Evergreen. Hardy. Sun. Shrub to small tree, with leathery dark green and yellow foliage. Good for coastal gardens. Evergreen. Hardy. Sun. Dense growing shrub, with leathery green and creamy-white leaves. Evergreen. Hardy. Sun. 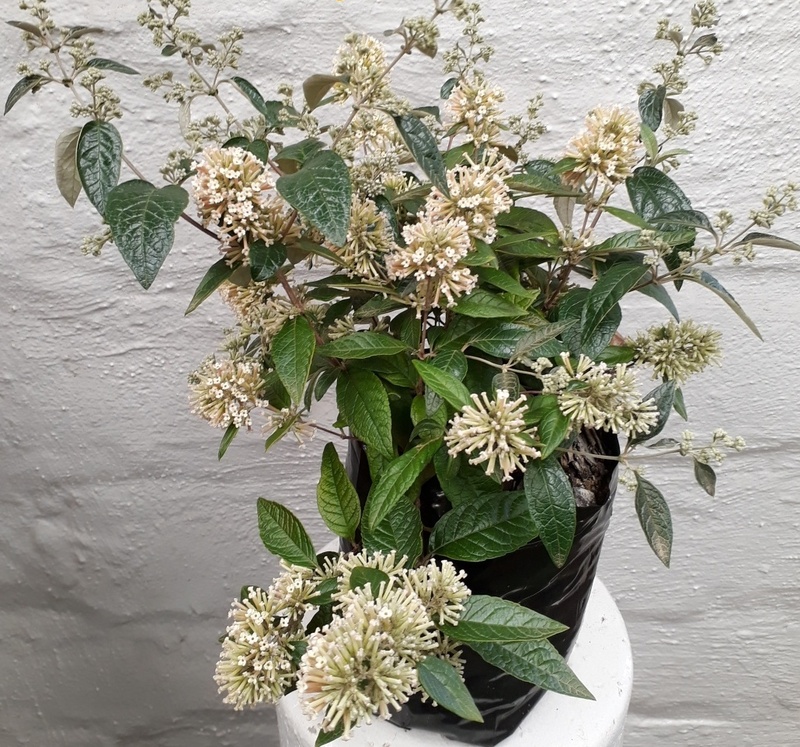 Slow growing, dark green glossy leaved shrub with fragrant, white flowers in summer. Evergreen. Semi hardy. Sun to semi shade. Small shrub with aromatic, glossy green leaves. Ideal for small hedges. Small white flowers from mid-spring to early summer. Evergreen. Hardy. Sun. Bushy shrub with aromatic, glossy green leaves. Fine white flowers from mid spring to early summer. Evergreen. Hardy. Sun. Ornamental shrub with green foliage and beautiful autumn colours. Semi deciduous. Sun to semi shade. Dense shrub with small green leaves and white flowers in summer. Flowers followed by red berries in autumn. Leaves show beautiful autumn colours. Hardy. Sun to semi-shade. Indigenous. Attractive upright shrub with soft, hairy leaves. Pink flowers from mid-spring to summer. Will grow well in coastal gardens or in marshy conditions. Evergreen. Semi-hardy. Sun. Indigenous. Small upright, bushy herbaceous shrublet. Serrated, leathery leaves with red margins. Purple flowers with dark purple streaks in spring & summer. Evergreen. Semi-hardy. Sun. Indigenous. Bushy, low growing plant with green serrated, curvy, hairy leaves. Pink flowers from September to October. Evergreen. Semi-hardy. Sun. 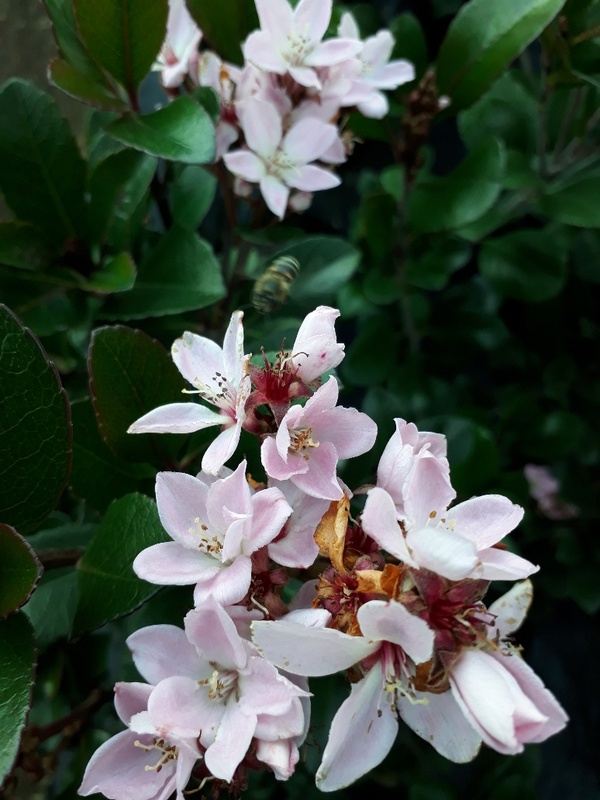 Evergreen shrub with lemon scented leaves and pinkish flowers with purplish markings on the upper petals from spring to summer. Sun. Indigenous. Tough shrub with kidney-shaped, cupped hairy green leaves with red tips. Pinkish purple flowers with dark veins from Sept. to Feb. Evergreen. Hardy. Sun. Indigenous. Small shrublet, 450 mm tall . Flowers throughtout the year but has a peak period during September and November. Erect, much-branched shrub with incised leaves that are strongly rose-scented and pink to white flowers from late winter to summer. Hardy. Sun. Easy to grow perennial with narrow, bright green foliage and trumpet shaped pink flowers from spring to late summer. Evergreen. Hardy. Sun. Easy to grow perennial with narrow, bright green foliage and trumpet shaped purple flowers from spring to late summer. Evergreen. Hardy. Sun. Penstemon has colourful tubular flowers on tall spikes. This plant thrives in hot, sunny conditions. Sun. Upright shrub producing masses of single, white, citrus-blossom scented flowers in summer. Evergreen. Semi-hardy. Semi-shade. Large shrub with tropical effect. Bright green serrated foliage and greenish-white flowers in summer. Evergreen. Semi-hardy. Semi-shade to shade. Medium-large plant. Deep bronze-plum leaves with arching tips. Sun to shade. Hardy. Bushy, dark green shrub with leathery leaves. New growth is red. Delicate white flowers in summer. Evergreen. Hardy. Sun. Glossy dark green leaves with yellow margins. Scented pale yellow flowers in spring. Evergreen. Semi hardy. Sun. Dense shrub with light green, white and pink foliage. Evergreen. Semi hardy. Sun. Dense shrub or small tree with bright green leaves and black stems. Evergreen. Semi hardy. Sun. Dense shrub or small tree with light green, mottled foliage. Evergreen . Semi hardy. Sun. Dense shrub with light green an yellow foliage. Evergreen. Semi hardy. Sun. Indigenous. Fast growing, large soft shrub with big soft oval hairy leaves. Flowers pink, white or purple in Autumn. Evergreen. Semi Hardy. Semi Shade. Indigenous. 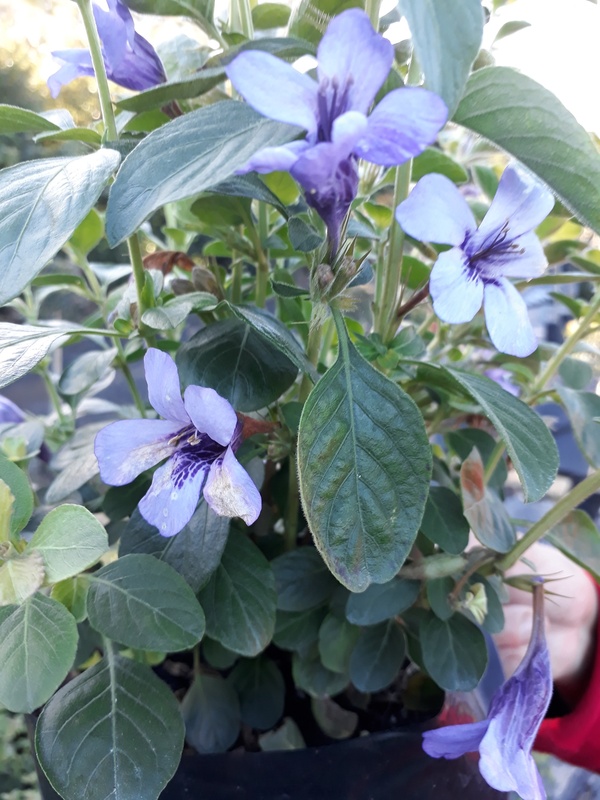 Erect shrub with velvet textured leaves and dark purple flowers mid-summer to winter. Prefers moist soil. Shade. Indigenous. Bushy shrub with a semi climbling habit, and white flowers, mostly in summer. Evergreen. Semi hardy. Sun to shade. Indigenous. Bushy shrub with a semi-climbing habit, and light blue flowers, mostly in summer. Evergreen.Semi-hardy. Sun to shade. Indigenous. Bushy shrub with a semi-climbing habit, and dark blue flowers mostly in summer. Evergreen. Semi-hardy. Sun to shade. Indigenous. Small compact rounded shrub. Masses of mauve-pink flowers almost throughout the year. Evergreen. Sun to semi-shade. Semi-hardy. Indigenous. Fast growing, free-flowering shrub with light green foliage, and masses of magenta-pink flowers spring to autumn. Evergreen. Semi hardy. Sun. Succulent shrub with creeping prostate habit. Similar to P. afra. Drought tolerant. Indigenous. 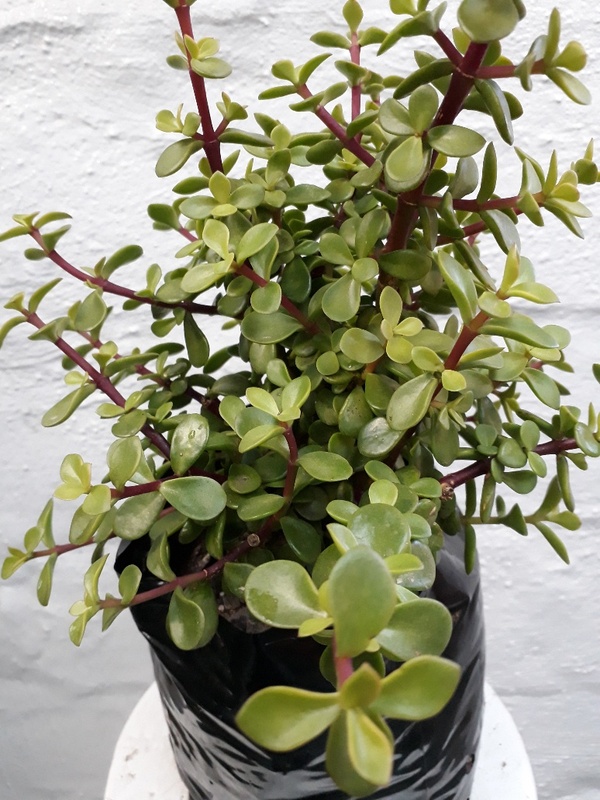 Succulent shrub or small tree with small, round, fleshy leaves on red stems. Masses of small, star shaped pink flowers in late winter to spring. Evergreen. Hardy. Sun. Indigenous. Large shrub or small tree with big glossy green leaves. Yellow flowers in Spring followed by red berries. Evergreen. Semi Hardy. Sun to Semi-shade. This shrub displays reddish green shoots which turn to leathery green leaves as they mature. Clusters of white to pink flowers are borne late in winter and spring. Evergreen. Hardy. Sun. Shrub with dark green leaves, and fragrant white flowers in summer. Evergreen. Hardy. Sun. Dense, dark green and glossy leaved shrub. Masses of single pink flowers in spring. Evergreen. Hardy. Sun to semi-shade. Shrub with golden yellow trumpet-like flowers in summer. Evergreen. Tender. Indigenous. Scrambling shrub or small tree with attractive glossy green foliage. Tiny reddish to purple fruit in late summer to autumn. Evergreen. Semi-hardy. Sun to semi-shade. Indigenous. Attractive fern with glossy foliage. Fronds are leatherly, coarsely toothed, triangular, and light to dark green in colour. Often used in flower arrangements. Evergreen. Shade. Tuft-forming plant with pointed, glossy dark green shoots that look like leaves. Ideal for flower arrangements. Evergreen. Sun to semi-shade. Bright green shrub, branchlets have needle-like foliage and red, bell shaped flowers in summer and autumn. Evergreen. Semi-hardy. Sun to semi-shade. 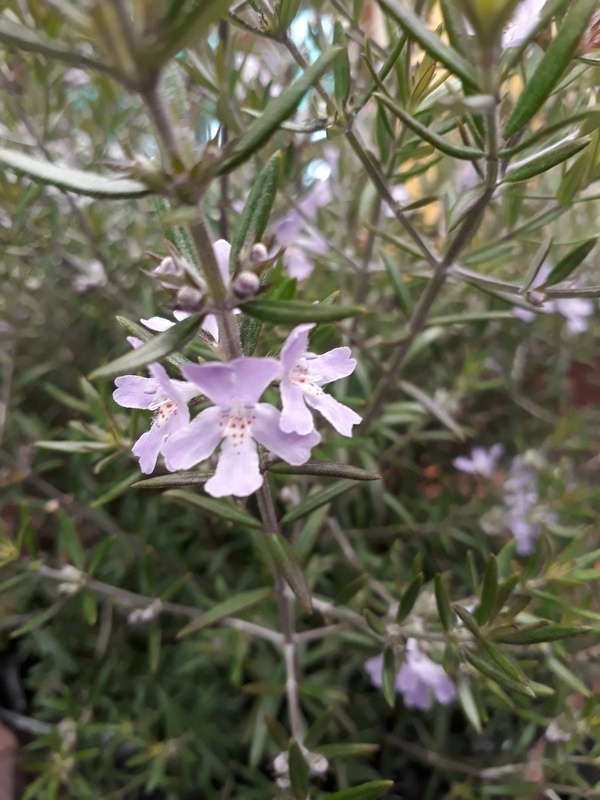 Fairly fast growing shrub with soft, grey foliage, and brown flowers in winter to summer. Good coastal plant. Evergreen. Hardy. Sun. Indigenous. Fast growing shrub with soft light green leaves and spikes of pure white flowers in summer to autumn. Good coastal plant. Evergreen. Sun. Indigenous. Good coastal shrub with soft, light green leaves and spikes of bright blue flowers in summer and autumn. Evergreen. Sun. Upright shrub with green leaves. Spikes of red flowers in summer to autumn. Leaves have lovely pineapple scent when crushed. Cut back in winter. Evergreen. Semi-hardy. Sun. Perennial with bright blue flowers in summer and autumn, ideal for rockeries. Evergreen. Hardy. Sun. A hardy evergreen shrub that bears flowers in clusters on long stems during summer. Available in Red, Lipstick and Wine. Full sun. Narrow leaved, much branched shrub with hairy white and violet flowers borne en masse from summer to autumn. Cut back in winter. Evergreen. Tender. Sun. Rounded shrub with aromatic, finely toothed, grey-green leaves. Bright yellow flower heads are borne in mid and late summer. Likes well-drained soil. Evergreen. Semi-hardy. Sun. Rounded shrub with aromatic, finely toothed, compact grey leaves. Bright yellow flower heads are borne in mid and late summer. Likes well drained soil. Evergreen. Semi hardy. Sun. Shrub with white flowers all year round. Evergreen. Tender. Sun to semi-shade. Shrub with purple flowers all year round. Evergreen. Tender. Sun to semi-shade. Shrub with dark bluish-purple flowers all year round. Evergreen. Tender. Sun to semi-shade. Bright green shrub with masses of single white flowers on weeping branches in spring. Deciduous. Hardy. Sun. Indigenous. Tall, erect, sword-shaped leaves. Extremely drought tolerant. Dark orange and blue flowers in autumn to spring. Evergreen. Hardy. Sun to semi shade. Indigenous. Fast growing large shrub with bare stems, topped by large banana-like leaves. Large white and blue flowers. Evergreen. Semi hardy. Sun to semi-shade. Indigenous. Slow growing, grey-green shrub. Dark orange and blue flowers in autumn to spring. Attracts birds. Evergreen. Semi hardy. Sun to shade. 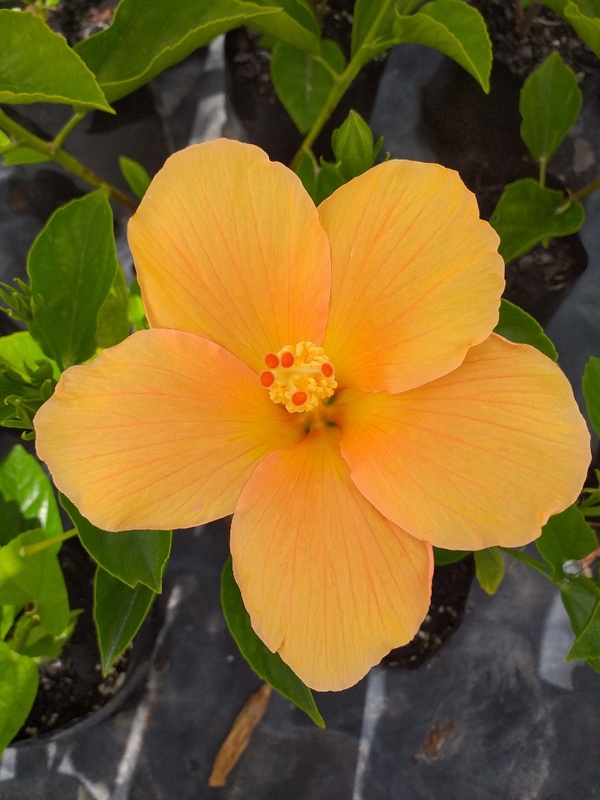 Compact shrub with masses of orange trumpet shaped flowers spring and summer. Evergreen. Tender. Sun. Small shrub with beautiful dark purple-black leaves and small lilac flowers in summer. Evergreen. Tender. Sun to semi-shade. Indigenous. Shrub with bitter aromatic leaves. Red-orange flowers appear in spring to mid-summer. Sun. Indigenous. A medium sized shrub with narrow leathery green leaves. New growth red. Cream flowers followed by black berries. Evergreen. Tender. Sun. Indigenous. 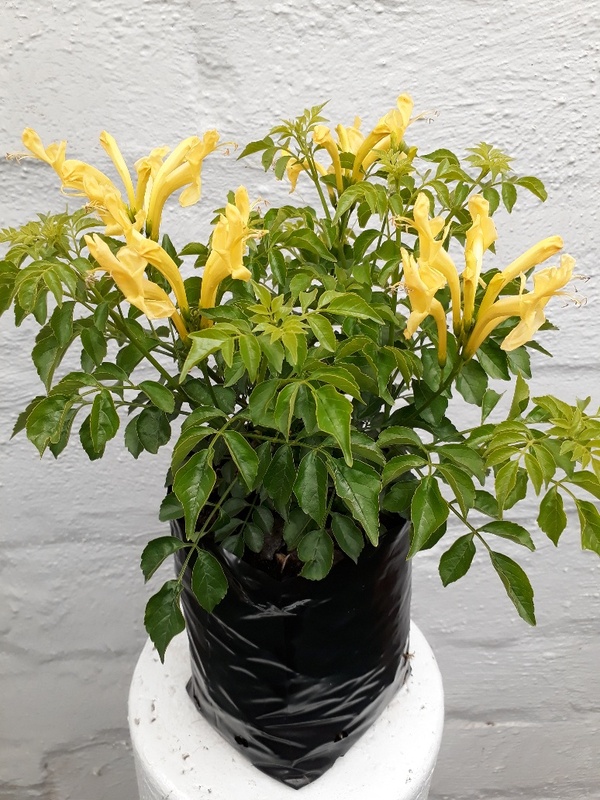 Fast growing, glossy leaved shrub with golden yellow flowers in spring and autumn. Drought resistant. Evergreen. Semi hardy. Sun. Indigenous. 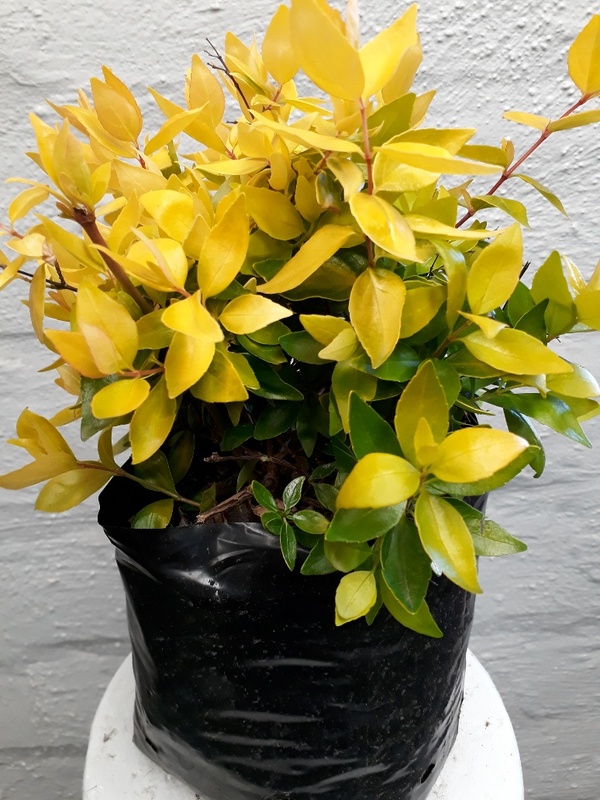 Fast growing, neat, glossy leaved shrub with masses of yellow flowers in spring and autumn. Drought resistant. Evergreen. Semi hardy. Sun. Indigenous. 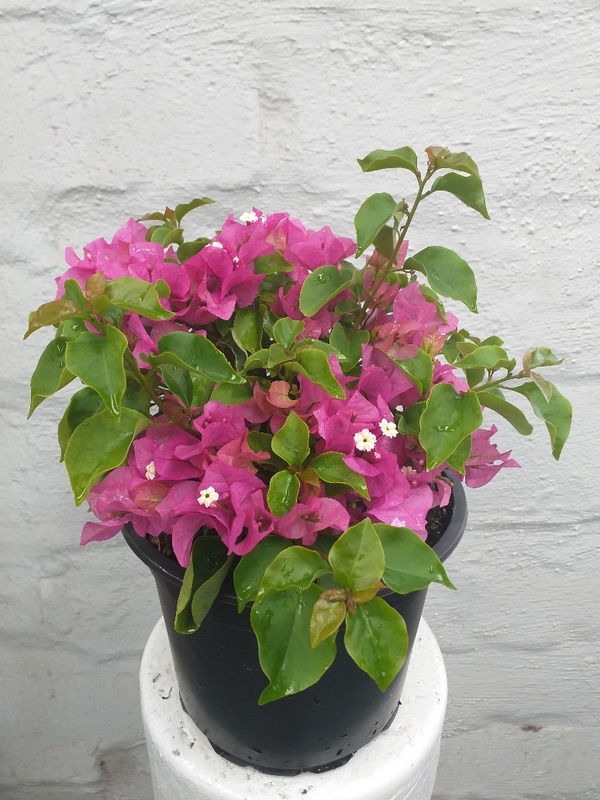 Fast growing, glossy leaved shrub with pink flowers in spring and autumn. Drought resistant. Evergreen. Semi hardy. Sun. Indigenous. Fast growing, glossy leaved shrub with salmon flowers in spring and autumn. Drought resistant. Evergreen. Semi hardy. Sun. Indigenous. 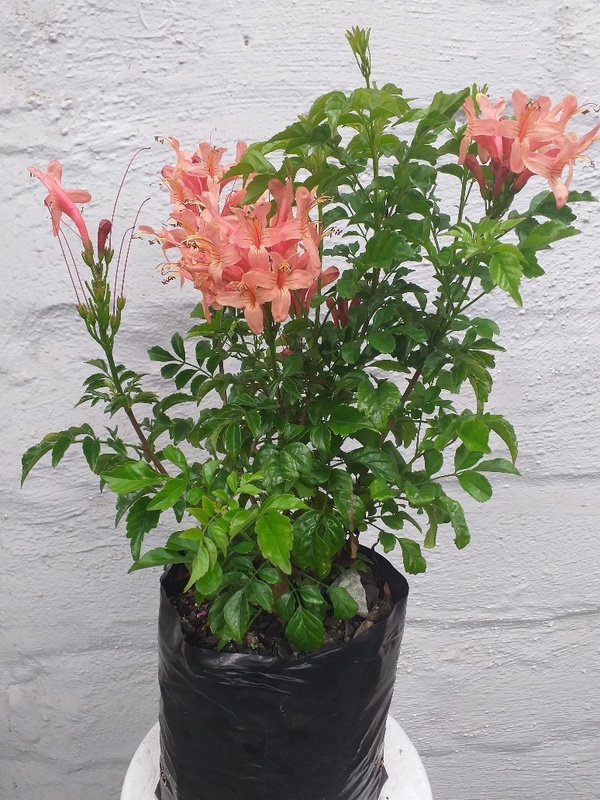 Fast growing, glossy leaved shrub with light orange flowers in spring and autumn. Drought resistant. Evergreen. Semi hardy. Sun. Indigenous. 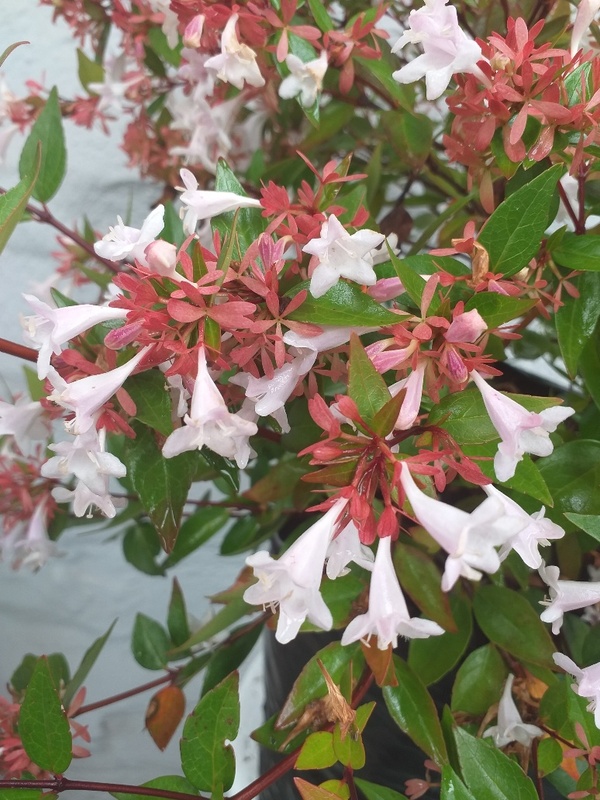 Fast growing, glossy leaved shrub with dark orange to red flowers in spring and autumn. Drought resistant. Evergreen. Semi hardy. Sun. Perennial, medium shrub with greyish-green leaves. Blue lip-shaped flowers in winter and spring. Evergreen. Semi-hardy. Sun. Small shrub with violet purple flowers in summer and autumn. Evergreen. Tender. Sun to semi-shade. 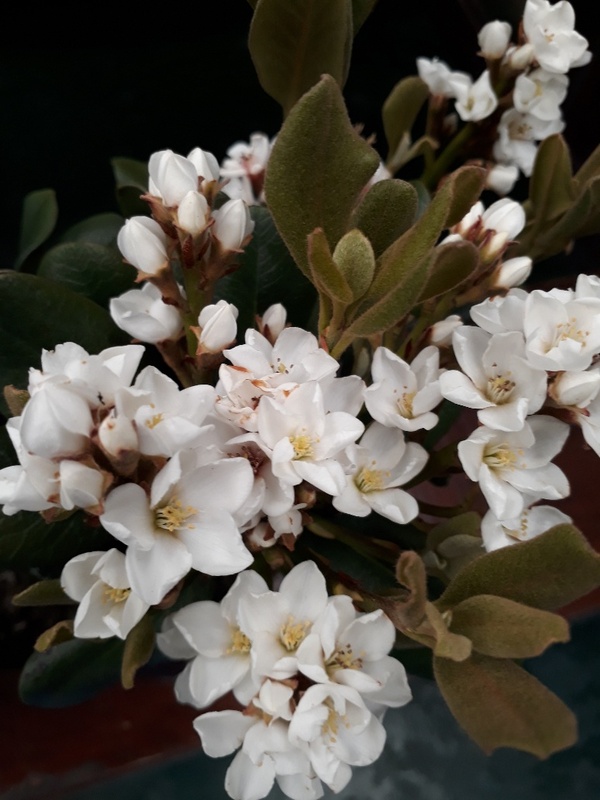 Dense, fast growing shrub with ball shaped white flowers in spring. Deciduous. Hardy. Sun. Fast growing shrub with dense, shiny green leaves. White flowers in summer. Evergreen. Hardy. Sun to shade. Dense, fast growing shrub with small compact leathery leaves. Clusters of white flowers in winter and spring. Evergreen. Hardy. Sun to semi-shade. 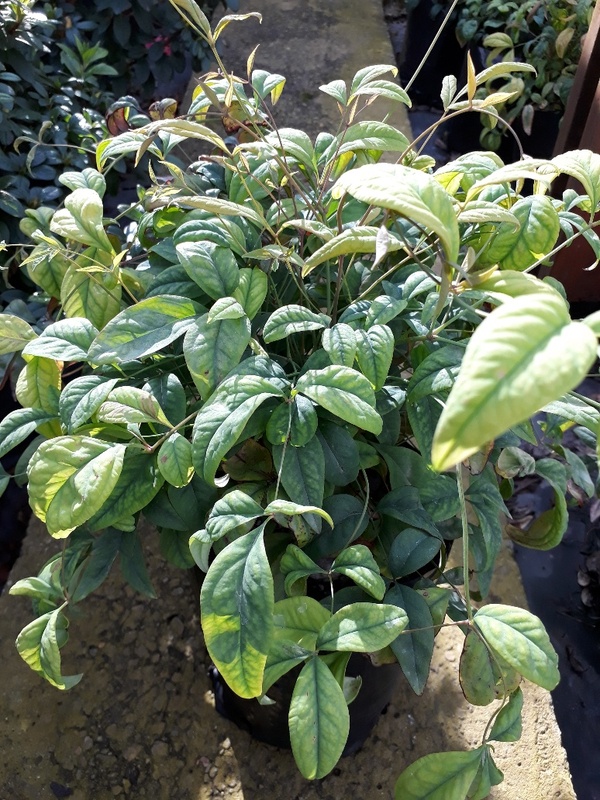 Dense, fast growing shrub with glossy leathery leaves. Delicate white flowers in winter and spring. Evergreen. Hardy. Sun to semi-shade. Fast growing shrub with dark green leaves and red-brown new growth. White flowers in winter and spring. Evergreen. Hardy. Sun. Shrub with yellow and green leaves, and white flowers in winter and spring. Evergreen. Hardy. Sun. Bulbous plant with strap-like leaves. Flowers on long stalks in spring in pink, white, salmon and orange. Needs well-drained soil. Deciduous. Semi-hardy. Sun. Shrub with green and cream coloured foliage, and light pink flowers in spring. Deciduous. Hardy. Sun. Shrub with pink trumpet shaped flowers in spring. Deciduous. Sun. 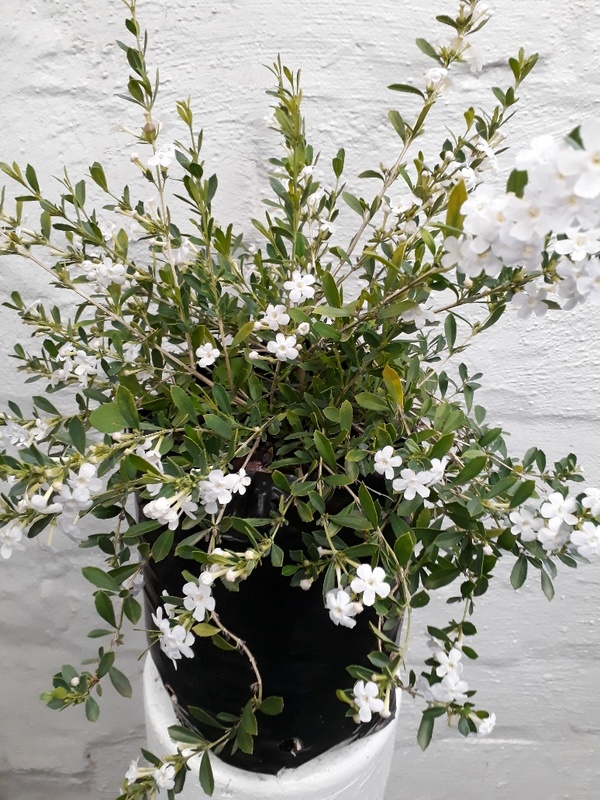 Fast growing shrub with grey-green foliage and white flowers in spring to summer. Good coastal plant. Evergreen. Hardy. Sun. 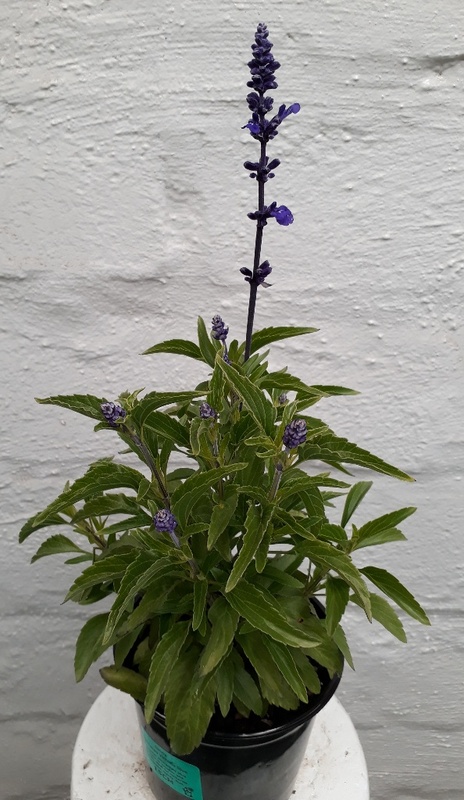 Fast growing shrub, with grey-green foliage and blue flowers in spring to summer. Good coastal plant. Evergreen. Hardy. Sun. Tough shrub with rosette-like clumps of pointed, sword shaped cream and light green leaves. Evergreen. Sun to shade. Tough shrub or small tree, with rosette-like clumps of pointed, sword shaped green leaves with a creamy-white edge. Good for patios and indoors. Evergreen. Hardy. Sun to shade. Tough shrub with rosette-like clumps of pointed, sword shaped light green leaves. Good for patios and indoors. Evergreen. Sun to shade. Indigenous. Tuberous plant with white flowers on long stems in late winter to mid-summer. Tolerates wet conditions. Evergreen. Hardy. Sun to semi-shade.